This meal is fast and fun, a great way to spice up a dull morning and bring a brunch favorite to the work week. Growing up in the South, sausage gravy was a staple on our breakfast table, so I wanted to create a healthier version--with a secret ingredient. Simply the best Moussaka, you would never know it is vegetarian!! Carrot cake and pancakes together? Now, that's a breakfast we can get behind! These flavorful carrot cake pancakes might taste indulgent, but they're low in both fat and calories. Top with low-fat cream cheese and a drizzle of maple syrup for an even more decadent morning meal. We put a California spin on a classic Italian salad. It's the perfect light lunch or starter. Omelet packed with veggies and flavor. This easy, cheesy breakfast casserole will get you to sneak some veggies in first thing in the morning. Serve hot with a slice of whole-wheat toast. Crustless quiche, perfect for phase 1 of south beach. This french toast does not need extra butter or syrup after baking! This hearty, savory meal was inspired by leftover baked potatoes. 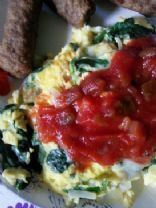 The result is a quick breakfast loaded with protein. Great recipe!!! Tasty and filling. By nature of being vegan, this recipe is cholesterol free, though I suppose you could change that and use regular butter and milk instead if that's what you have on hand. This is a plain recipe that will make a biscuit-like scone, but you can jazz them up with whatever you have around: cinnamon, blueberries, dark chocolate chips, etc. all the joy of hash browns w/o the calories! Start these the night before for an easy satisfying breakfast or brunch. These are large, very moist apple-cinnamon muffins perfect for a busy school day. You don't even have to tell the kids that there are beans in them - and you don't have to believe that they're low fat and protein filled, either!